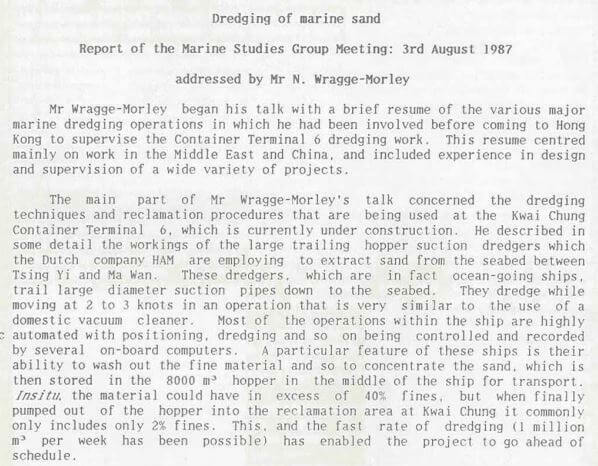 James Chan: The Geological Society of HK Newsletter Vol 5 (2) published in 1987 contains this article about what I think is a new subject for the website. The dredging was done by the Dutch company Hollandsche Aanneming Maatschappij, better known as HAM. The Geological Society of Hong Kong homepage The Geological Society of Hong Kong (GSHK) was established by a group of local geologists in 1982 with an aim to advance geological sciences in Hong Kong and to provide a platform for both professionals and amateursto meet. Since then, GSHK holdsregularly geological conferences and seminars, and organises local and overseas field trips for both members and non-members to explore the geological world. At present, the society maintains a steady membership of about 250, including professional geologists from the public and private sectors, academia, as well as teachers, students and amateurs.